When your gas boiler is leaking water, remember that you should never try to repair the boiler yourself, only registered Gas Safe engineers should conduct repairs. A boiler leaking water is not something that you should ignore, in fact it’s usually a serious problem often meaning a seal or valve has broken. A leak can lead to rusting of other components or worse, shorting other electrical components within your boiler. So your best option when you notice a leak is to fix the problem quickly and prevent any future damage. It can be difficult to diagnose why your boiler is leaking. It may be that your boiler is leaking from the bottom or your boiler could be leaking inside. Before you call an engineer, here are some areas to check. If your system is leaking from the boiler pressure valve then it’s best to check if the pressure is too high. The boiler pressure relief valve is designed to leak water as a safety protection feature to prevent damaging your appliances. To identify if you have an over-pressure fault, look at the gauge needle on your boiler, it should be pointing in the green section, set to around one bar. If it’s in the red, that indicates over-pressure. You can bleed your boiler to reduce the pressure but often the issue is limescale or other obstructions in your system. If so, then you’ll need a Gas Safe registered engineer to take a look. Was over-pressure making your boiler leak water from the bottom? Is your boiler pressure too low? If the leak is coming from the temperature valve, then there may be an issue with the temperature probe in the boiler. In most circumstances boiler leaks are caused by corroded pipes or in the water tank which breakdown over time. If the corrosion is on an individual component a Gas Safe engineer will be able to replace this with ease. However if the corrosion is widespread then you’ll need to replace the boiler. If you have an old boiler, the benefit of buying a new boiler will pay back quickly. 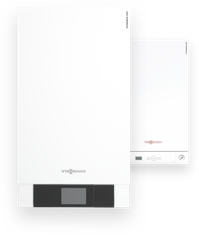 Not only are new boilers reliable but they are efficient, saving you money all year round. They say prevention is better than the cure, so keeping your system topped up with an anti-corrosive agent like Fernox which will help keep your boiler running healthy. Fernox F4 not only prevents corrosion but it’s one of the best DIY fixes for leaking boilers on the market. Fernox F4 works like a sealant and because boiler leaks are often very small, it plugs those holes, making it easy to quickly fix your system, working in just a few hours. Even so, once you start developing water leaks in your boiler system then it’s worth seeking specialist advice to prevent further leaks from occurring. If your boiler is leaking water around the pipe fittings, then there’s a possibility that it’s an installation fault. This issue is often found with new boilers if the engineer has badly sealed the pipe fittings. To check, dab the area dry then wait to see if the water appears again, if so a ¼ turn might do the trick. However there’s a chance that the PTFE tape on the inside of the fitting might need checking, then it’s time to call the engineer. The very nature of boiler is that the whole system is sealed, over time, those rubber seals begin to harden or can be destroyed by elements moving through the heating system. This is mostly a common fault with old boiler systems, but it can also affect new boilers if the system has been running over pressure. How long should a pump last? There are times when the problem is terminal and like when the boiler leaks water from the heat exchanger. One of the most expensive parts of a boiler is the heat exchanger and if it’s split then the best option is to replace your boiler. Now that you know what is causing your boiler leaking water, you can take the next step. Some fixes are easy to do, but in most cases it’s best to call a Gas Safe registered engineer. There are many excellent engineers who will give impartial advice as to the most cost effective solution to fixing your boiler leaking water. What should I do if my boiler loses pressure?